Over the past few months, however, I began to notice that Battle Ground seems to have a good number of hypnotherapists: There are three different therapists located on Main Street alone. I knew that we had a health-focused section coming up in The Reflector, and thought now was the perfect time to experience hypnosis and write an article about it’s various health benefits. I pitched the idea to my editor and made a few calls. Before I knew it, I was reclining on a cozy leather chair in hypnotherapist David Hill’s Battle Ground office, getting ready for my first session. I only had one session, and it wasn’t as long as Hill’s regular hypnosis sessions, which often last 90 minutes to two hours, but I still feel like the hypnosis affected my subconscious thoughts. At least for one day. Will I go back? Probably. I’ve been trying to make healthier decisions most of my life, but there’s always been something holding me back – that “devil on my shoulder” that tells me to reach for the doughnuts before broccoli, and convinces me that watching a movie on the couch is way more fun than going to yoga class. I think hypnotherapy might be the “thing” that finally conquers that shoulder devil. When we look back into ancient history, we find that the trance like state that we call Hypnosis has been used for thousands of years. In fact, from the study of primitive peoples’ religious and healing ceremonies there exists the elements essential to place people into a hypnotic state. By rhythmic chanting, monotonous drum beats, together with strained fixations of the eyes, the village shaman or priest is able to induce catalepsy of the body. This helps to give the shaman the appearance of having magical and mystical powers given to them by the gods. Today we call it suggestion therapy. The use of suggestion therapy goes back much further than Mesmer. If Mesmer were to be called the Father of Hypnosis, then the great, great —- grandfather of Hypnosis could be the ancient Egyptian priest, Imhotep. (I-em-hotep, he comes in peace) Hypnosis, suggestion therapy can be traced back over 4000 years to ancient Egypt. The Egyptians used healing sanctuaries to heal people with all sorts of problems, both physical and mental, most of which today would be classified as psychological problems. These healing sanctuaries were called “Sleep or Dream Temples.” In these temples, the sick person was put into a trance like sleep; priests and priestesses then interpreted the person’s dreams to gain knowledge about the illnesses and to find a cure for the illnesses. 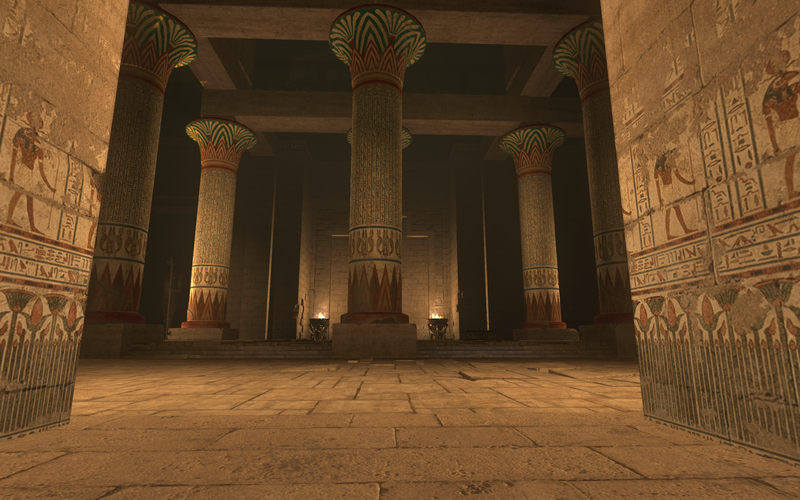 The tradition of temple sleep dates back to the time of Imhotep. The ancient Egyptians worshiped the priest Imhotep and dedicated Sleep Temples to him; he is the earliest known physician. He was the physician vizier, architect and priest, to the pharaoh Zoser (2650 – 2590 B.C.). 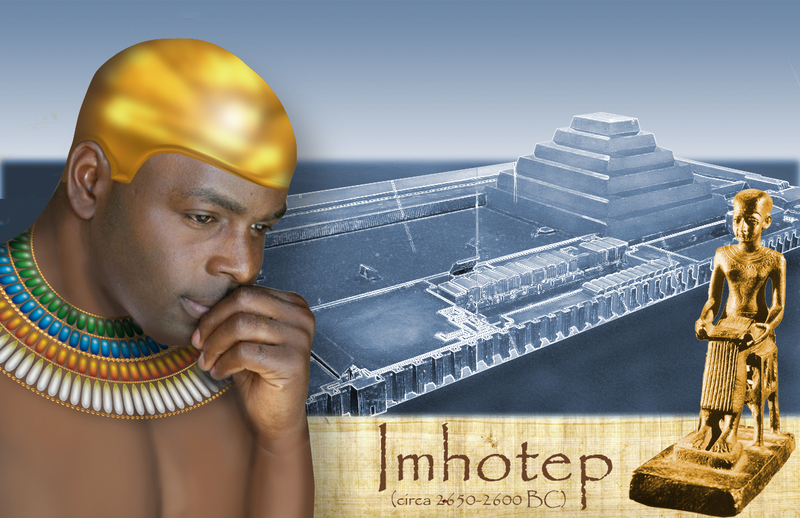 Imhotep built the step pyramid, which is the first pyramid. In recent times Imhotep has become a Hollywood star; the name of Imhotep was used for the priest who became the Mummy in the latest film “The Mummy”. Temple sleep was used as a psycho-therapeutic tool; the temples of Imhotep were well attended by people looking for psychological help. Under the influence of incantation and the performance of religious rituals, sick people were prepared psychologically for suggestion therapy; they were put in a “hypnotic state.” Before falling asleep they were influenced by suggestions, in the hope of provoking dreams sent by the gods. Today in some parts of the Middle East and Africa you can still encounter shrine sleep. Sleep Temples were and are used for the mentally ill, as a place where priests interpret the sick person’s dreams. Thus, by the use of suggestion, (and the help of the god) the priests appear to cast out bad spirits from the mind and body of the sick. Æsclepius (also spelt: Asclepios, Æsclepius, Æsculapius, Æsclepius) was a healer, his mythical roots going back in to the second millennium BC, he became a demi-god. Over time he evolved into a temple god in his own right. The temples in his honor were temples of healing dreams. His daughters were Hygea and Panacea. A Klínè was a sacred place or a sacred skin set out around the temple, where the sick person reclined to enter the dream state. From these names we have derived the words, Panacea, Hygiene and Clinic. At the height of the cult’s power, there were 420 temples, spread across the ancient Greek empire. Healing would take place while the person being cured was in a deep trance like sleep. The god Æsculapius could perform miraculous cures in the dreams. This sleep would come about by the power of the priests, who used chanting and magical spells to put the patient into a trance. This trance state was known as incubation; incubation is derived from the Latin, in (on) cubare (to lie down). A person could be kept in this state for up to three days, during which time the priests using suggestions would help the person, through their dreams, to make contact with the god, thus helping them to obtain a cure for their illness. The temples were a place of spirits, and mysterious powers, a place to find mental and physical healing. People looking for a cure or an insight to their problems were called Seekers. A Seeker had something on their mind, an ailment, an issue, and an inner quest to discover themselves. They came to seek an insight into their problems, to contact the healing god, to get a new vision that would heal, guide, or provide comfort. The path to the Temple was lined with huge the steles made of marble, on which were carved inscriptions, describing all the miracle cures, and the miraculous healing that had taken place in the Temple. It was claimed that people were cured of incurable diseases; the lame were able to walk again, people who were blind could see again. They were cured by the sole supernatural healing power of the divine dream. A good dream would be one in which the god would cure the wound by touching it. Once the person woke from their sleep, the attendant would spend time with them, reviewing any visitations from god, helping to explore the dream and secure the insights appropriate to that seeker at their stage of development. The dreams of the seeker contained the seeds of their own healing. The attendant’s job was simply to elicit the vision of the god and aid the seeker in making sense of their personal dream story. Through incubation, the seeker was to awaken to his real self and in so doing regenerate himself physically, mentally and spiritually. Today we recognize a lot of what went on in the Temples as suggestion therapy. Over time the priests developed a greater understanding of herbs and their use. They started to move away from the sole use of dream interpretation and suggestion therapy, using their growing knowledge of herbs; they started to develop unguents, tinctures and medicines. While dreams in their early forms involved a direct visit from the god, over time the dreams became more metaphoric, the dream became symbolic of the person’s problems. The attendants became dream interpreters, from these interpretations the priests would make up prescriptions for medicines. Over the past 4000 years, the Sleep Temple, the Priest and Dream Sleep, have slowly evolved in to what has become modern Doctors, hospitals and medicine. The ancient Hebrews used meditation with chanting, breathing exercises and fixation on the Hebrew letters of the alphabet that spelled their name for God, to induce an ecstasy state called Kavanah. (These ritualistic practices are very similar to Auto-hypnosis). In the Talmud, Kavanah implies relaxation, concentration, correct attention (motivation). People such as fire-walkers, and priests who used the religious practice of laying on of hands to make people faint onto the floor, are using Auto-hypnosis to bring about an altered state of consciousness by the use of suggestion and expectation. GUELPH — You are getting very, very … no, not sleepy. In fact, just the opposite: More awake, more aware of the inner impulses that drive you. The stereotype/myth of the hypnotist as a kind of magician that puts a person, or groups of people in a trance and makes them do what they wouldn’t normally do, continues to taint the practice of hypnosis. But that’s not really what hypnosis is all about. The therapeutic technique, which has been around for several hundred years, has grown in popularity, and respect, in recent times, while its applications have broadened. “An area where hypnosis has had all its myths come about is in stage hypnosis,” said Jacques Gouws, a clinical psychologist based in Hamilton, and past-president of the Canadian Society of Clinical Hypnosis. “This is the stuff where someone gets on a stage and calls people up and makes them look silly.” Playing around with hypnosis is actually dangerous, Gouws said. Someone with a particular mental health problem, an emotional sensitivity, or a specific trauma can have a psychological door opened through hypnosis that can cause a serious mental crisis. But there are many ways in which hypnosis can be used as a tool to try to change habits, eliminate phobias, foster a sense of inner peace, and overcome a host of life challenges. Habits are deeply rooted in the subconscious mind, and accessing that part of the mind is where hypnosis has its power. Phil Naylor runs the Glen Tara Centre for Hypnosis and Wellness in Guelph, a growing hypnosis practice that aims to help clients with anxiety, panic, phobias, pain management, and overall wellness, among other things. His business offers counselling, psychotherapy and hypnotherapy. Hypnosis is not mind control, he said, but there is a general misconception that it is. 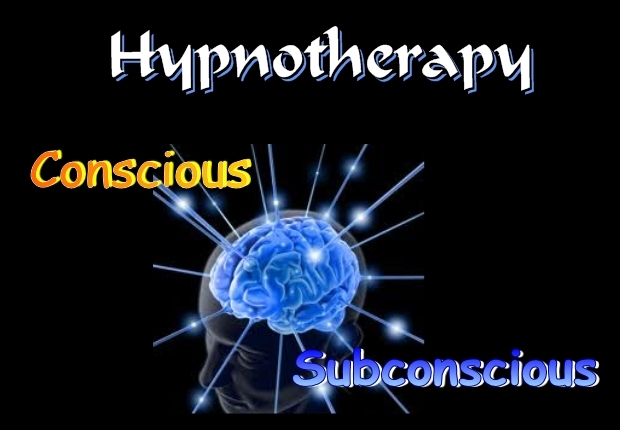 Those under hypnosis are fully conscious and aware during the process. For the most part, hypnosis is very safe. 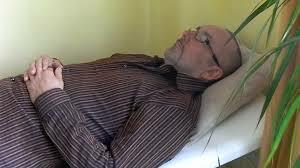 “There are not many people that do hypnosis in Guelph,” Naylor said. “Part of the issue with hypnosis is that people don’t understand it. There needs to an education process because people don’t think about hypnosis for the things they might be dealing with. It is certainly not part of the mainstream vocabulary of health or mental health.” People seek hypnosis at his office for depression and anxiety, pain management, and anger management. If you grind your teeth at night or have an unusual phobia, a practitioner like Naylor may be able to help. Say you want to be a more confident person, someone who feels more capable of succeeding at what you put your mind to. Perhaps something within your subconscious, a fear or a negative belief, is acting as an impediment to self-assurance. Hypnosis can help get to the bottom of it, according to certified hypnotist Angela McClenahan. McClenahan recently moved her hypnosis practice from her home in Burlington to a modern office building at 848 Gordon St. Her Guelph Hypnosis Works specializes in serving people working to achieve smoking cessation, weight loss, stress management and greater confidence. It can also help enhance academic and sports performance, and manage pain, she said. McClenahan said if you want to quit smoking, change eating habits, gain control over negative impulses and attitudes, hypnosis can help by essentially giving you better access to the subconscious processes that influence your behavior. We may not always know why we do what we do, she said. Hypnosis can help access the underlying motives behind our behavior. McClenahan demonstrated one method of instilling a kind of a mental anchor that helps reorient the mind. In this example, she was helping instill an anchor for self-confidence. Close your eyes and picture a circle on the floor in front of you, she instructed. The circle could be a hula hoop, a rope, a painted line, or a series of stones. Then, think of someone who embodies the qualities you want to instill in yourself, she said. Identify those good qualities in your mind. Once you have them identified, place those characteristics in the circle and step inside. Now, envision absorbing those characteristics up through your feet to the top of your head until they are fully embodied in you, at least on the level of thought. Then step back out of the circle and make a fist. The making of a fist will be your trigger in situations where you want those admirable, self-assured qualities to come to the fore. During a test to determine if a subject was susceptible to hypnosis, Naylor asked the subject to hold a pendulum over a piece of paper that had a circle on it. The circle had a vertical line and a horizon line across it. He instructed the subject to relax, to watch the pendulum and imagine it going back and forth in one direction. The pendulum moved in that direction, apparently without any movement in the fingers of the subject. When asked to imagine it stopping, it stopped. A succession of suggestions made the pendulum go up and down, and in both clockwise and counter-clockwise directions, with stops between each new direction. The subject was clearly susceptible. Naylor said subjects who respond well to hypnosis are not gullible. Instead, they tend to be people with a good imagination, who can fully visualize things suggested to them. A good rapport between the hypnotist and the subject is also important. The state of hypnosis, she explained, is similar to the state we find ourselves in just before falling asleep or in those few moments after waking. It is a very relaxed state of mind in which we are still aware of our surroundings but not really thinking about them. It is not uncommon to enter such a state while doing ordinary things. One can move into a kind of hypnotic state while driving, finding they have travelled some distance without fully remembering the details of the route or without noting the amount of time that has passed. Individual human beings are made up of various parts, go through numerous stages of life, and perform many roles, Gouws said. Things happen in different parts and at different times of our lives that we may not understand or be aware of, but which affect us over the long term. McClenahan said many of her clients are taught the techniques of self-hypnosis. With smoking cessation, those techniques are relatively straightforward and don’t take long to learn. But things such as stress management or weight loss are a longer process, the root of the problems running deeper. Single hypnotic sessions are not offered at Guelph Hypnosis Works, but, rather, programs are offered involving varying numbers of sessions, at various costs. The nitty-gritty details, or the deeper secrets of a problem, needn’t be revealed to a hypnotist, McClenahan said. Challenges such as weight gain are symptomatic of deeper, often subconscious fears, anxieties or traumas. The weight gain is a symptom of an emotional/psychological issue that must be accessed to get to the root of the problem. McClenahan referred to the work of family therapy pioneer Virginia Satir, who identified a number of “coping stances” that influence our behavior and can get in the way of healthy relationships and lifestyles. Some of us are placaters who are always trying to please others — always focused on others as opposed to themselves. There are blamers who always blame someone or something else for their problems, distractors who constantly distract themselves from their problems and thinkers who overanalyze. Unless the trance experience is particularly threatening, or if there is a posthypnotic suggestion not to remember the experience, a patient will remember everything that happened while under hypnosis. Some people are much more susceptible to hypnosis than others, and are able to go very deeply into their past experiences and see them as though they are watching a movie, Gouws said. Many are able to regress back to infancy. But regressing back to times of abuse and trauma, he reiterated, is potentially risky.